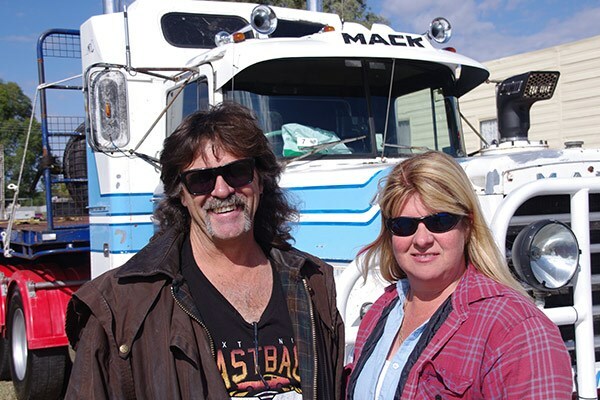 Mark and Elaine Abbott’s 1969 Mack Flintstone attended Crawlin' The Hume following the Harden Truck Show. Photo by Tamara Whitsed. Mark and Elaine Abbott with the Flintstone at Harden. Photo by Greg Bush. This old Atkinson hitched a ride to Harden on the back of Mark Abbott’s Flintstone. Photo by Greg Bush. 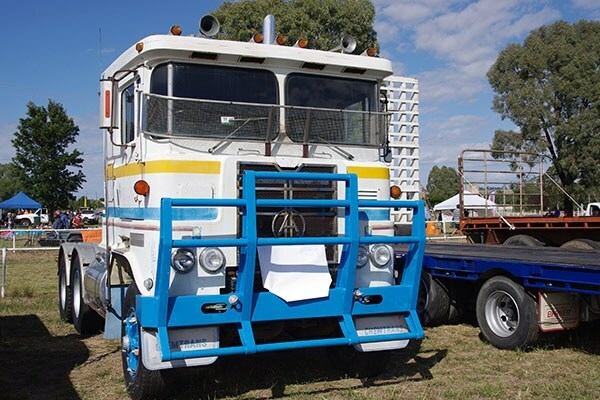 It’s just over an hour’s drive from Cowra to Harden, which proved no problem for Mark and Elaine Abbott’s 1969 Mack Flintstone for its third Harden Truck and Tractor Show. With a trailer on the back, it also hauled a mate’s Atkinson to the event. 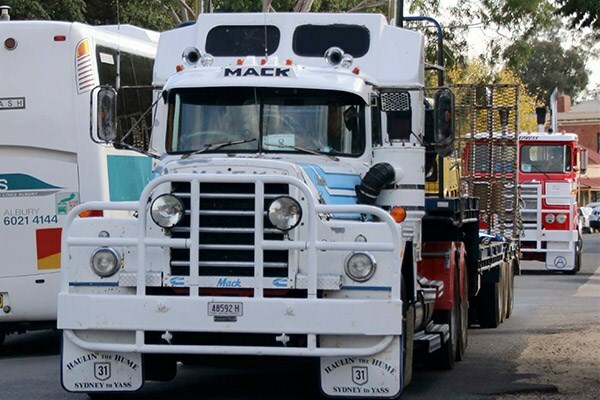 Mark says he bought the Mack three years ago as a "play toy". "It’s got Hendrickson suspension, it’s powered by a VT 903, and I’ve just put a 15-speed Roadranger in it," he explains. "It’s very unique". Mark explains that the Flintstone has had 10 owners, and he’s tracked down most of them. "But we don’t know who put the 903 in it." What he does know is that it started off as a 711 with a duplex box in Newcastle, later sold at auction in 1975. At one time it ran Sydney to Melbourne for Border Express. The Flintstone had been sitting idle in a paddock for six years when Mark bought it: "I fell in love with it, of course." Getting the Mack mobile proved no issue. "We just washed it," Elaine smiles, although Mark had to make some minor adjustments to get it on the road. "We pressurised the start tank, put a battery on it, turned the key, hit the button and it started, and we drove it home," he explains. "I put a different rear end in it to get better road speed, because it was sitting on 2500 revs doing 97km/h." The Flintstone is not the only Mack in the Abbott’s collection. There’s a recently retired CH model which Mark bought nearly 10 years ago, and a new Super-Liner. "We’ve got a ’79 model Dodge," Mark says. "It’s a work in progress, but the Flintstone takes priority." Mark has, for the most part, been a Mack man since he started working for Aztec — now Boral — 25 years ago. "I started in a 285 Mack, an S-Line after that, then I got a Valueliner. I was in love when I got that," he says. "Then I ended up with a 650, then I bought an Eagle — I didn’t have that for very long — then I bought the CH and hardly spent a cent on it. "It’s done 1.5 million kilometres and still has the original injectors and the original compressor."